LETHBRIDGE - Lethbridge Hurricanes fans may only spend a few dollars on a raffle ticket at each home game, but together over time, they are making an enormous impact for people in the community through the United Way. 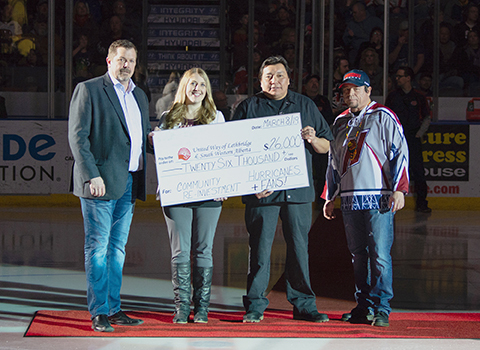 On Friday, March 8, United Way recognized all those who contributed to a fundraising total an entire season in the making. Through the home-opener tailgate BBQ in September, and jersey raffles at each home game since, over $26,000 has been raised for United Way’s Community Fund. Including games since then, that total has grown to $28,872, and is expected to grow a little more yet throughout the Hurricanes’ playoffs run. About one-third of the total was raised thanks to a special program sponsored by friend of United Way, Darren Malchow. This season, eight lucky fans each won a fully embroidered Dylan Cozens jersey, along with a meet & greet with Cozens following the game. Malchow, along with his son Vance, dropped a ceremonial puck at the March 8 game to celebrate the end of the regular season, and also be recognized for their support which Marietta-Vasquez said was instrumental. United Way provides funding for local programs in the areas of poverty reduction, building healthy and inclusive communities, and helping children and youth be all they can be. Each year, thousands of people access programs funded by United Way. A large part of the credit for the fundraising goes to the volunteers who assist with tickets sales. United Way’s raffle volunteer coordinator Connolly Tate-Mitchell said this year, a new volunteer partnership between United Way and Lethbridge’s Southern Alcare Manor has resulted in a number of sold-out raffles and a new level of gratitude. SAM representatives Harley No-Runner and Terry Eaglespeaker gave their time to support nearly every game of the season. The two were on hand on March 8 to help acknowledge the Hurricanes and fans for their support.